Cozy First Floor Condo ~ Directly on the Emerald Coast!! This first floor gem with the living area that opens to a patio where you're only steps away from the white sand and surf. This beautifully decorated condo sleeps 6 with a king bedroom, hall bunks for the kids and a queen sleeper in the living area if needed. 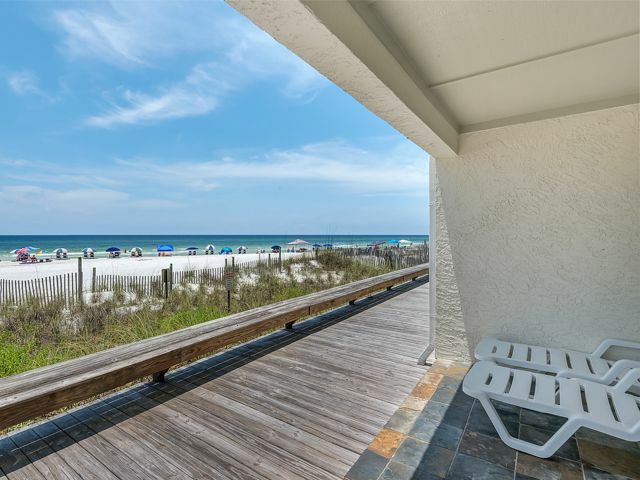 It's a favorite destination and so close to Seaside and other area activities along 30-A. Enjoy crabbing and fishing at nearby Eastern Lake. * Saturday to Saturday rental in season. * Wi-fi service in unit. * Parking for 1 car. Will stay there again next time for sure! As always I enjoyed my stay at Seaside/Seagrove beach but was a little disappointed with this rental. I’ve stayed in these condos 3 different times but this was the first time in this particular one. The smell greeted us when we opened the door. Ugh! Refrigerator /freezer smelled also and the furniture was dirty. Luckily, the view was fabulous and never disappoints!!! A bottle of Febreze and dryer sheets saved the day!! Also for a place where no pets are allowed there were animals all around us.?? Nonetheless, we had a good time and enjoyed the beach despite the issues! Excellent location as close to the beach as you can get. Quiet. Furniture has seen better days, but adequate. Comfortable bed and nice to have two half baths separate from the shower.